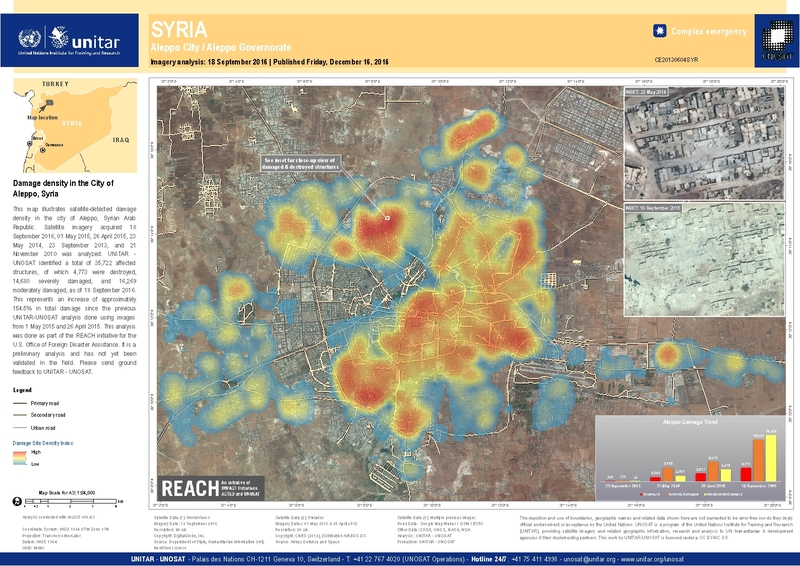 This map illustrates satellite-detected damage density in the city of Aleppo, Syrian Arab Republic. Satellite imagery acquired 18 September 2016, 01 May 2015, 26 April 2015, 23 May 2014, 23 September 2013, and 21 November 2010 was analyzed. UNITAR - UNOSAT identified a total of 35,722 affected structures, of which 4,773 were destroyed, 14,680 severely damaged, and 16,269 moderately damaged, as of 18 September 2016. This represents an increase of approximately 154.5% in total damage since the previous UNITAR-UNOSAT analysis done using images from 1 May 2015 and 26 April 2015. This analysis was done as part of the REACH initiative for the U.S. Office of Foreign Disaster Assistance. It is a preliminary analysis and has not yet been validated in the field. Please send ground feedback to UNITAR - UNOSAT.